O'Grady uPVC's commitment to quality is further evident in our requirement of exceptional performance in our glass. This led us to source a range of glazing units from manufacturers Carey Glass International. For our "A" rated windows Carey Glass supply us with a top-performing double-glazed unit comprising a Planitherm Total high performance low-emissivity glass internal pane and Diamant outer pane. The Planitherm Total pane has a transparent metallic coating that reflects heat from internal sources such as radiators back into the room, rather than allowing it to escape through the windows. At the same time it allows passive solar heat gain, warming your home and further contributing to the energy efficiency of your windows. This unit from Carey Glass also offers improved aesthetics without the unsightly yellow tint normally associated with traditional low-emissivity coatings. This means your curtains or Georgian Bars will not look dirty or discoloured. Less tint also means more light can enter the room, making it more comfortable and luminous. For over 40 years Carey Glass International's Vista Therm has been the best known sealed unit in the market, outperforming the competition in terms of thermal performance, reducing heat transfer rates and improving condensation resistance. The adoption of Vista Therm insulating glass in a broad range of residential and commercial glazing applications has produced dramatic energy savings, as well as improved aesthetics and comfort. 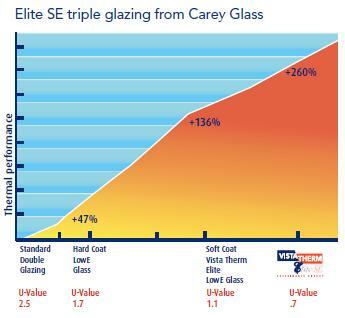 Vista Therm Elite SE is the latest innovation from Carey Glass International. It is a triple glazed unit offering the highest level of insulation in the market with a U value as low as 0.7, a full 260% increase on a standard double glazed unit using ordinary clear float glass. Using two unique elite coatings and inserting Krypton gas into the cavities of a 28mm overall thick triple unit combinations, Carey Glass has created the highest performing insulated glass unit. This product and the level of insulation it offers will add value to any property and increase the energy rating as well as reducing fuel costs. Triple glazing has a further benefit in its ability to insulate against noise. Modern life sees greater dependence on transport and many householders now find they are on a flight path or adjacent to a busy route which has a massive increase in road traffic noise. Noise pollution can be very disturbing and most architects are now incorporating and acoustic evaluation on planned developments. Double glazing can help counter the noise entering a structure and triple just goes one step further in adding to the comfort level attainable. Carey Glass International also supplies the highest performing double glazed units utilising the most advanced insulation technologies. 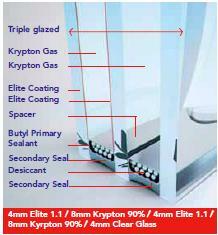 This high performance insulating glass performs up to 136% better than standard double glazing. Changes in government building regulations, Document L, aim to improve the thermal insulation and energy efficiency of Irish homes and buildings. Virtually all new and replacement windows, doors, rooflights and conservatories installed will need to have a maximum u-value of 2.2, a performance that can only be achieved using low emissivity glass. VistaTherm Elite easily surpasses this requirement with it's U-Value an exceptionally low 1.1. Thanks to this special energy saving coating the flow of heat from fires and radiators stays inside the home during cold weather, heat which ordinary double glazing allows to escape. Heat from the sun stays outside in hot weather, resulting in greater comfort and lower energy costs, while still allowing light to pass through. Common applications are doors, low level glazing, conservatories and all high risk areas as specified by BS 6180, BS 6206 and BS 6262. An extensive range of FireGlass is also available for insulation and integrity. Georgian bars are fitted into the units to result in a maintenance free solution. A wide variety of colours are available. Lead can be applied to units either on one side or both sides of the glass. Lead is available in 6mm or 9mm thicknesses and can be darkened for a more traditional effect. Because of its flexibility lead can be used in many different ways. By replacing the inner pane with CareyGlass Low Emissitivity glass one can realise substantial heat gain. Carey's K-Glass reflects heat back into the room thereby reducing heating costs. CareyGlass' extensive Rainbow collection features decorative designs in interchangeable colours suitable for a wide range of uses including door panels, door bevels, toplights and special features.